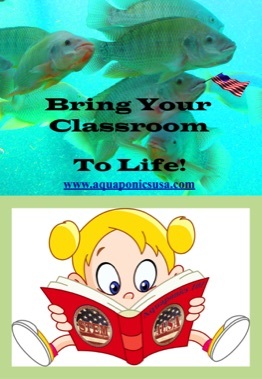 Are you looking to create a STEM Classroom with Aquaponics? 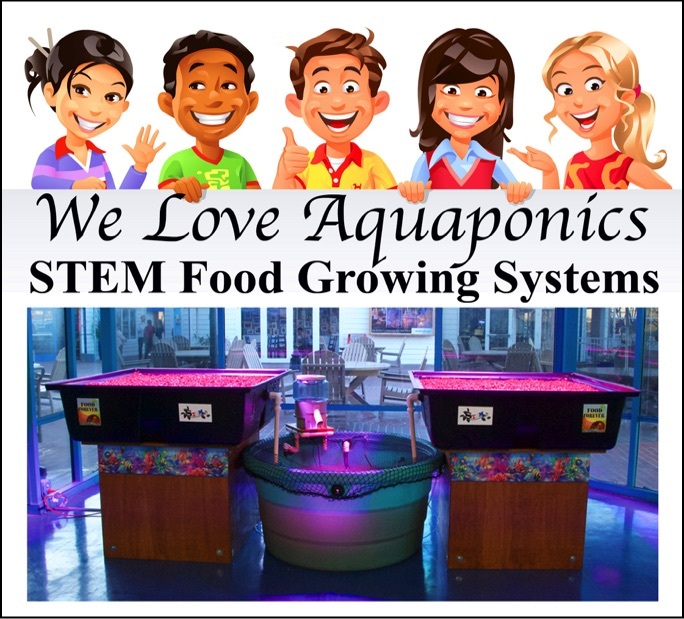 We have Aquaponics STEM Food Growing Systems that can turn an ordinary classroom into an exciting hands-on STEM Classroom in a matter of hours. See what you can grow below. Go to our Home Page to see our Systems. In contrast to our cheery imagery, we feel compelled to share the importance of learning Aquaponics because if there was ever a time in the modern era to start growing food--it is NOW. Have you noticed that we are surrounded by countries with crashing economies? Have you noticed how the economies of the world are all interwined? Have you heard the many economists warning us that the U.S. will be affected by a projected worldwide economic melt down? Never mind the fact that our own government along with many governments in the developed world has been printing dollars out of thin air under the guise of "Quantitative Easing". This reckless economic behavior will not end well. Eventually, the dollars presently held in American households as a result of savings and hard work will be de-valued along with future dollars coming into American households, and we will face hyperinflation and perhaps even food shortages. Aquaponics (AP) is our answer. Aquaponics is a hybrid food growing technology combining the best of aqua-culture (growing fish) and hydroponics (growing veggies without soil), and it's completely organic because the fish waste is your natural fertilizer and that means no pesticides. 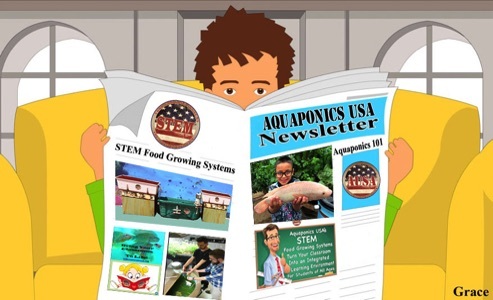 Aquaponics USA is dedicated to sharing information, developing products and bringing awareness of this life sustaining technology to every American household and School because it's time Americans become Food Indepenent. 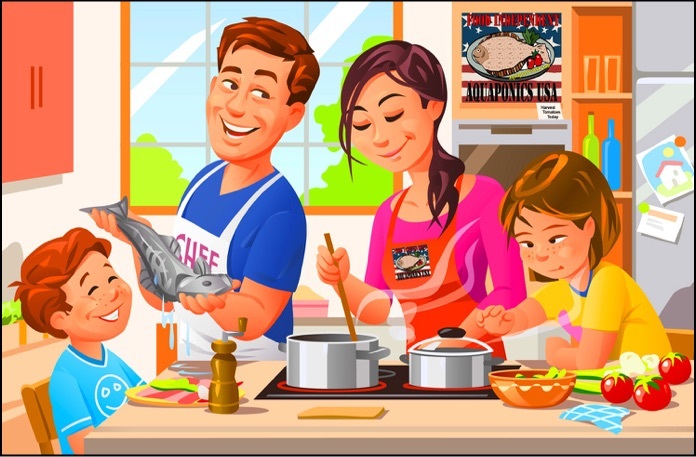 Aquaponics USA is Feeding America, One Family At A Time and Teaching America, One School At A Time with our Aquaponics Family & STEM Food Growing Systems. We have Systems that range from 15 to 80 square feet of Grow Bed space and Fish Tanks from 100 to 320 gallons. Plus we offer everything you need to start on the road to Food Independence with Aquaponics. Go to our AP Products pull down Menu Bar at the top of the page or here's a clickable list of all of our products: Tilapia Fingerlings, Tilapia Fish Food, Automatic Fish Feeders, Heirloom Seeds, Seed Starter Kits, Air and Water Pumps, Measuring Devices, Grow Bed Media, LED Grow Lights, Fluorescent Grow Lights, an Automatic Sprouter, Foodie and Prepper Items and Accessories. 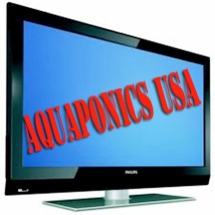 We refer to ourselves as your "One STOP SHOP" for Everything Aquaponic. Any farmer knows there’s a time to plant and a time to harvest. That time is dictated by the seasons. But Aquaponics needs to be a year round operation. It's not like you can stop eating in the winter. So we’re talking about feeding your family and teaching students year round regardless of the season. Unless you live in a season-less, tropical climate, you will need to place your Aquaponics Family or STEM Food Growing System in a protected environment. These systems come close to complete for those lucky enough to live in the tropics. For the rest of us, we have add-ons you will need to create your own tropical paradise including LED, and Fluorescent Grow Lights. Perhaps you would want to build or purchase a Greenhouse so you can take advantage of the sunlight that nature provides for free. These requirements are discussed in more detail on the Water and Fish pages. You can see how our Greenhouse and our Growroom progressed over the period of time since we built them in late 2008 and 2010 until we sold our California location and moved to AZ in 2016. Planting and harvesting are on-going activities, but we always make sure we plant something on July 4th. We feel that’s a perfect day to declare ourselves as people who are becoming Food Independent. We designate our fish and veggies by our Aquaganic™ Trademark. 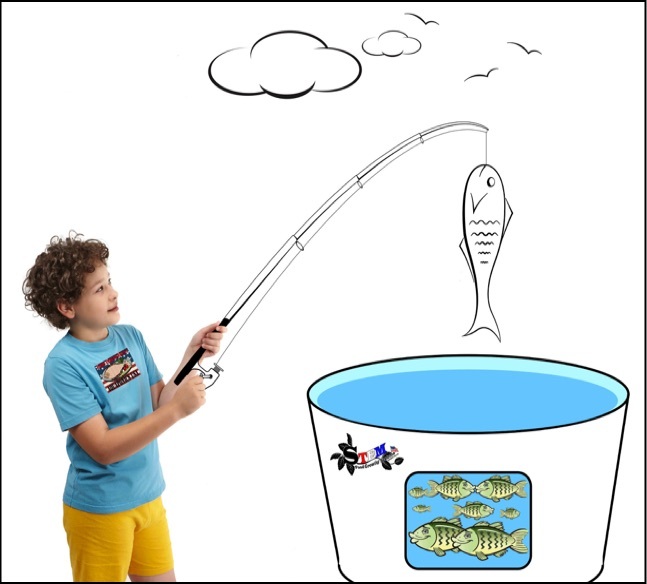 To be Aquaganic™ products must be GMO-Free and grown in an Aquaponics system. Spend some time with the scrolling images below to see the amazing variety of vegetables that can be grown in Aquaponics STEM & Family Food Growing Systems. The vegetables are only half of the Aquaponics story. The other half is all about the fish. 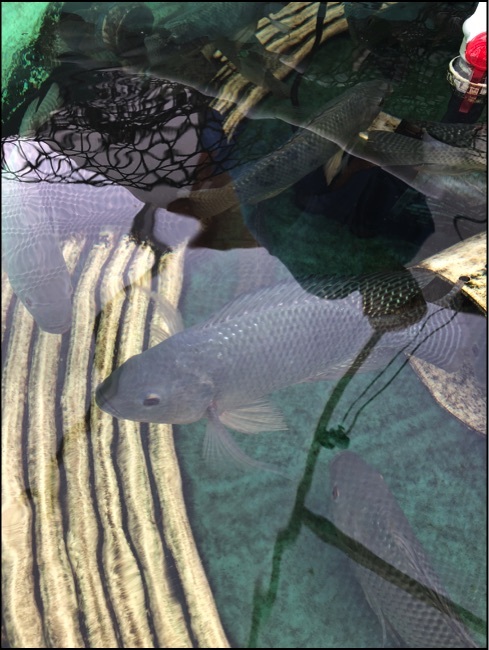 In fact, we regard the fish as so important, we call the Fish Tank "The Engine of our Aquaponics Family and STEM Food Growing Systems". Surprisingly enough, raising the fish is not that difficult as long as you're raising Tilapia because they are so resiliant and hardy. Therefore, they can withstand beginner Aquaponic Farmer water quality errors without croaking. 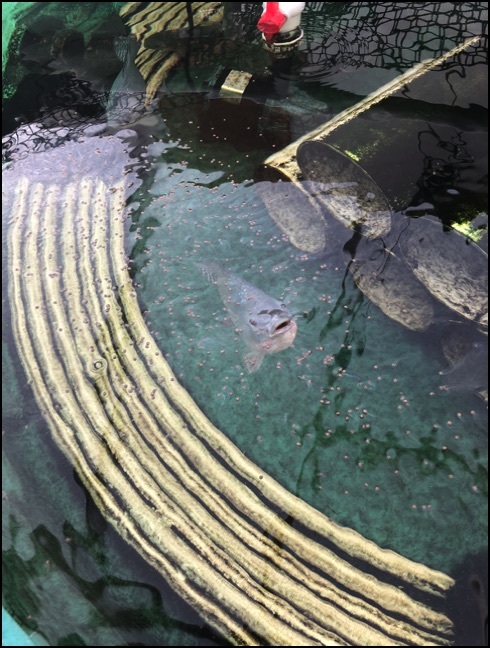 Because we were operating an R&D Aquaponics Lab for many years, we wanted to see how long Tilapia would live in an efficiently run system. 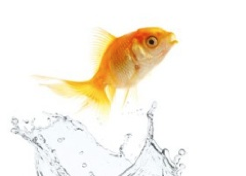 Many of our customers are vegetarians and want their fish to be worker fish running the engine of their system. Below in the picture on the left, are Tilapia Fingerlings we purchased in the summer of 2009. They are about three months old in the photo. When we closed down that system in the spring of this year, 2016, many of these same Tilapia were still going strong, huge (some were 30" long and weighed over 5 lbs.). But if you're planning to eat your fish, you don't want to let them get that big. A 1 1/2 lb. Tilapia makes for a delicious meal. The fish in the photo on the left are betweeen 1 and 2 lbs. If you're using an Automatic Fish Feeder, fish growing becomes an easy job because they pretty much take care of themselves. We sell Tilapia Fingerlings and Tilapia Fish Food. The principle activities going on in the Fish Tank are swimming, eating, resting after dark in the bottom of the tank, breeding, birthing, brooding the young--Repeat. They don't know they're normal activities are resulting in your being able to do one of the most important things on our planet--Grow Food! The Fish Tank is the Engine! Below is our economical STEM & Family Food Growing System, the FGS-20. Bring it into your home, garage, greenhouse or bring it into a Classroom. This is just one example of the four Basic Designs we offer. Go to our Home Page to see them all or click over to each different system from the Drop Down Menu above. These systems create a STEM Classroom in a matter of hours. The four different Aquaponics STEM Food Growing System Bundled Packages just for Teachers come complete with the Grow Bed Media, 25 Live Tilapia Fingerlings, Fish Food for 1 Year, an Automatic 5 lb. 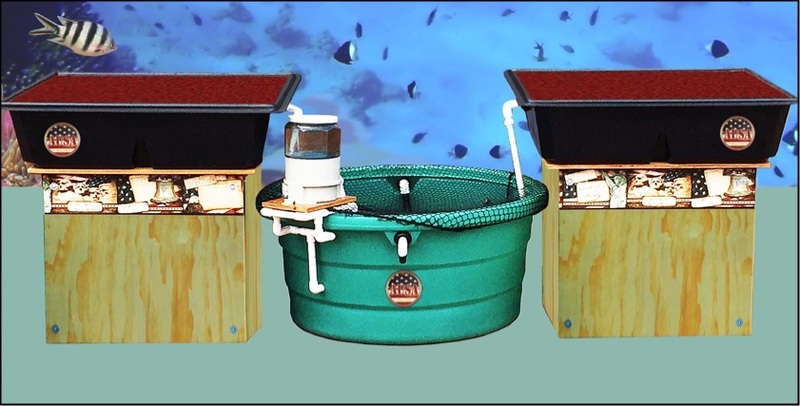 Fish Feeder, a 300 Watt Titanium Heater and a Seed Starter Kit (Grow Lights are optional). The entire bundle can be purchased with one Invoice. When you purchase the Family FGS-20, the add-on's described above are all sold separately. The FGS-20 STEM & Family Food Growing System has a 120 gallon fish tank and two 11 square foot, Rapid Cycle Deep Media Grow Beds like the ones you see here, for a total of 22 square feet of growing space. Go to our FGS-20 page for more information and details about this great Aquaponics STEM & Family Food Growing System for Schools and Homes. You can raise up to 20 fish at 1.25 pounds (0.5 Kg) each in this tank, which is about 38 pounds of fish per year. And it’s easy to Up-Grade. Click on the picture to go to the Home Page page, where it’s featured, for more details. This system requires 2 ft. of walk around space all around it. We also offer Aquaponics STEM & Family Food Growing Systems that don't require this walk around space and can be placed up against a wall. These are our EZ-Reach Systems. All of our Systems (except the Quick Kits) come with beautifully stained wooden pedastals that are sturdy and durable so the actually make a nice piece of furniture in your Classroom or Home. Below is a photo of one of our EZ-Reach Aquaponics STEM Food Growing System sitting in Ms. Beth Frost's Biology, Aquaponics and Environmental Science Classroom at Danbury High in Connecticut. 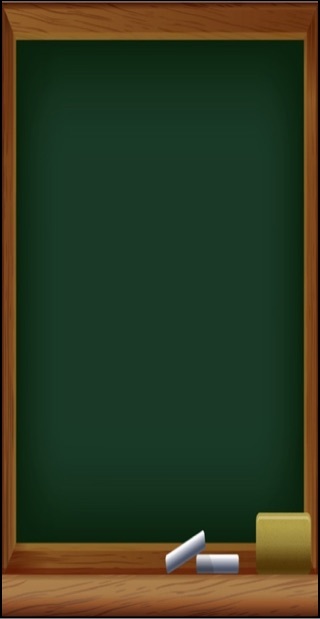 This System could have been placed against a wall because students can easily reach across the Grow Beds, hence its name. They have their Automatic Fish Feeder covered with the camouflage covering. You are looking at the back of the system with the manifold in view. This is a STEM Classroom ready to bring Learning to life. This is a call to every American to step up and embrace the change that’s coming. You still have time to set up your own Aquaponics Family or STEM Food Growing system. The time and money you spend will be so worth your effort as the price of food continues to sky rocket. What a beautiful lesson to pass on to your children and grandchildren and how incredible it is to turn a normal classroom into a magical world where Science, Biology and Chemistry come to life. In Closing on this Page about WHY Aquaponicsis, it’s important to also address how our family farms have been taken over by Big Agricultural Giants known as Factory Farms. These Big Agra companies care more about their bottom line than the health of the animals they raise, the nutritional value of the crops they are producing and the health of the people that the animals and the crops are feeding. The Food Movement is quite literally a movement away from Industrialized Food and a Movement toward being more Food Independent or at least a Movement to get closer to the source of our food, which means going back to locally grown, family farm food. There are activist groups against Monsanto and GMO’s. There are several important DVD’s and YouTube Videos out on the Food Movement including Fresh, Food Inc., MEATRIX Part I, MEATRIX Part II, The Future of Food, Food Matters, The World According To Monsanto, End Of The Line and more. Just Google these titles to purchase or watch these important and educational productions about food. There’s a now famous quote by Henry Kissinger that says, “If you control the food supply, you control the people”. Us Americans are all about being Independent, not controlled. It’s time to become FOOD INDEPENDENT! 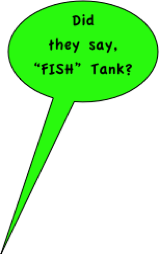 We've been using cartoon imagery on this WHY Aquaponics Page in order to bring levity to our very serious message. But when we talk about the possibility of food shortages, we're not talking to cartoon families, we're talking to real families. Don't wait until it's too late to become more Food Independent. Start growing your own food now. As we watch our financial system crumble before our eyes, our government contines to argue over cutting runaway spending. 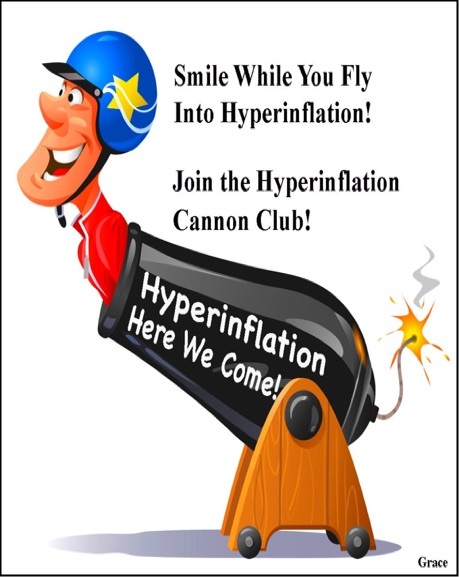 These reckless monetary policies will catapult us into hyperinflation like clowns out of a cannon. Don't be caught by surprise. Get your family prepared for what could be the most challenging economic times in the U.S. Start by learning how to grow food with an Aquaponics STEM or Family Food Growing System. We're setting that example and starting a Movement. Be sure to check out our Social Media Sites and our Daily Aquaponics USA Food & Health News newspaper called Paperli. You can access them at the top of our Home Page. 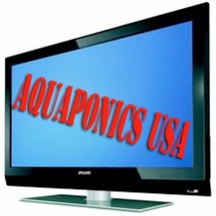 All of our Videos are on our About Page as well as on our Aquaponics USA YouTube TV Channel. Thank You for visiting our WHY Aquaponics Page; but you've just gotten started. There are lots of other pages to explore on this very extensive website about Aquaponics, Aquaponics Products, Aquaponics Accessories and our STEM & Family Food Growing Systems. Start exploring this Page by Reading through our Flip Book below. It explains WHY Aquaponics is so important at this time in our history. I love hanging with the FISH. This is our Modular System that can be expanded with multiples of this basic design. Teachers, are you ready to "Bring Your Classroom To Life"? We have a 33 page clickable pdf that tells you everything you need to know to create a STEM Classroom using our STEM Food Growing Systems. Just Click on the Cover to the right to open it. Are you looking to provide Food Security for your family? Do you want to avoid pesticides, petro-chemicals and GMO Food? You can grow your own Fish and Vegetables in a Family Aquaponics System.